The Centennial College campus that houses the Public Relations and Corporate Communications program has recently been re-branded. It was previously the Centre for Creative Communications, which makes sense considering the campus is part of the School of Communication Media and Design. 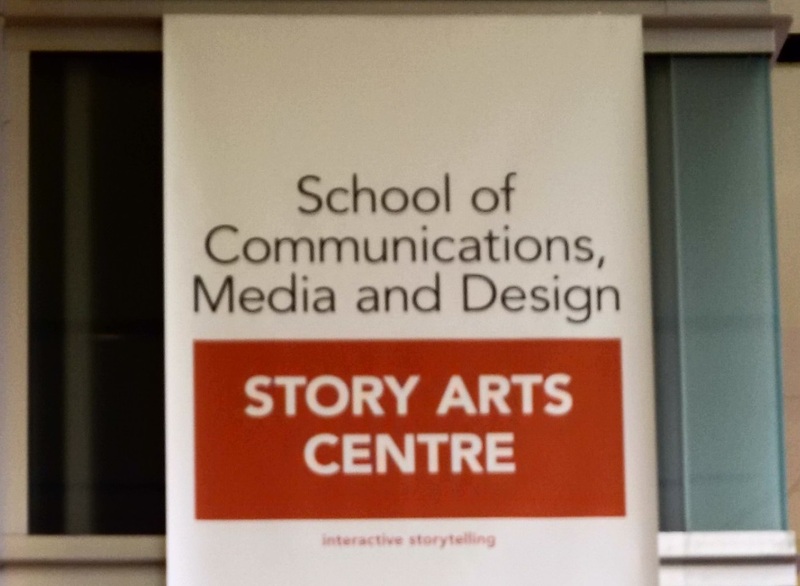 Starting this year though, our campus is called the Story Arts Centre. I have to admit that I found the new name underwhelming. When the new signage first went up, I remember speaking with some classmates who were equally unimpressed. From our conversations we all agreed that “Story Arts” lacks some of the cachet that comes with the businesses minded professional communicators we are striving to become. Recently though, I have come to peace with the new name and feel that is actually quite appropriate. What I didn’t like about the idea of being thrown in with “stories” is that I see it as the opposite of business communications. Stories to me are something make-believe or relegated to literature and poetry. In fact I often have a hard time sticking with reading literature, because I eventually get bored and want to read something non-fiction or “real” as I am accustomed to describing it. Obviously literature does have a lot to say about the real world, and in turn, non-fiction has many of the same elements of storytelling. Since being critical of the campus’ rebranding I have noticed that “the art of storytelling” is popping up everywhere. I’m not sure if it’s merely because I have been focused on it, or if it is a real buzzword that has been gaining traction all over the web. As I hear it more often, I feel Centennial made a smart choice in choosing Story Arts Centre. The idea of business communications becoming a “story” took root during a Copy Editing class last term. Our instructor, the notable author and historian Ted Barris, spoke candidly about how unpleasant and challenging it can be to wrote an Annual Report. His most helpful piece of advice was to view an Annual Report as an opportunity to tell a story. Once you understand the company’s history and people, you can tell their story in a new way. His approach must have worked, because he was hired to do a number of subsequent reports for the client. Similarly, in business class we learned that a financial statement is a story told in numbers. This isn’t just a classroom phenomenon either, I am seeing the same phrase in unexpected places. With summer in full swing and plenty of baseball to watch recently noticed that Sports Net TV advertisements emphasizes storytelling as well. In fact, their boilerplate from their website says, “Sportsnet is Fuelled By Fans, and delivers storytelling on a local, regional, national and global level.” Similarily, Stanford’s Business School has a tumblr (who knew?) and last month they also posted about effective storytelling in business through a series of key quotes. TED also has a nice playlist of talks on story telling if you’ve got an hour to spare. Lastly, as I was searching through internship opportunities for the upcoming season, I was looking at the websites of different agencies. The MSL Group pretty much sums up “Story Telling” in this two minute video. This entry was posted in Uncategorized and tagged CCPR, MSL Group, Sports Net, Story Arts Centre, Story Telling, TED on May 26, 2014 by The Benign Propagandist.